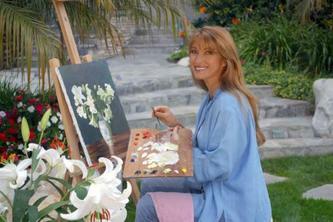 Actress, artist, author, and designer Jane Seymour will be exhibiting her artwork at the P & C Art Galleries in Washington DC and Old Town Alexandria, Virginia. The exhibit will include 76 recent oil paintings, watercolors and limited edition prints. Opening receptions with the artist will be held on Friday, April 27, 6:30-9:00 pm at P & C Art at 3108 M Street NW. Washington DC., and Saturday, April 28, 6:30-9:00 pm at 212 King Street, Alexandria Virginia. Call 703-698-8452 to RSVP.